Hear ye, hear ye! The good folks from Saleduck has nominated me for the inaugural Food Blogger Award. Wow! I'm tickled but heck, it's an opportunity I can't refuse. I guess there's always a first time for everything right? 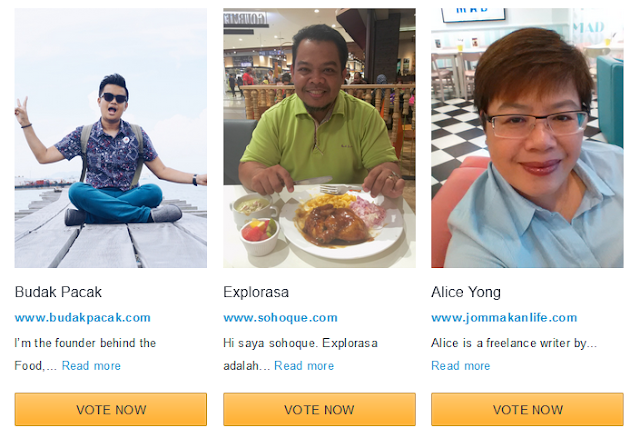 Now, it seems the blogger who gets the most votes wins. I'm up against some really heavyweights (no pun intended) yo! If you've enjoyed reading my blogposts, I'd love your support. Go to the Saleduck webpage where YOU can vote for me...or other food bloggers of your choice. LOL...all's fair in love and online voting! Thank you in advance for your support! Have a good week ahead. Only the Chinese wouldn't bat an eyelid at eating fish head - something most people may consider weird and bizarre. Hence it should come as no surprise eateries specialising in fish head noodles should thrive in our local food scene. One such restaurant is Mr Fish Fishhead Noodle Restaurant in Damansara Kim, where discerning fish head noodle fans will readily stumped up for a taste of the Fried Tiger Grouper Fish Head Noodles (seasonal price). During our visit, we tried the equally agreeable Fried Barramundi Fish Head in Traditional Milky Soup (top pix, RM11.90). Tomato wedges, strips of salted vege (hum choi) and ginger piled on the nuances and textural interest to the soupy ensemble. Opened in December 2014, owner Khoo Yong Hian revealed his shop features his mom-in-law's fish noodles, fish paste and rojak sauce recipes. Fresh fish supply is trucked down from Butterworth so as far as premium fish heads go, the variety changes depending on market availability. While waiting for your fishhead noodles to arrive, try some of the side dishes available. 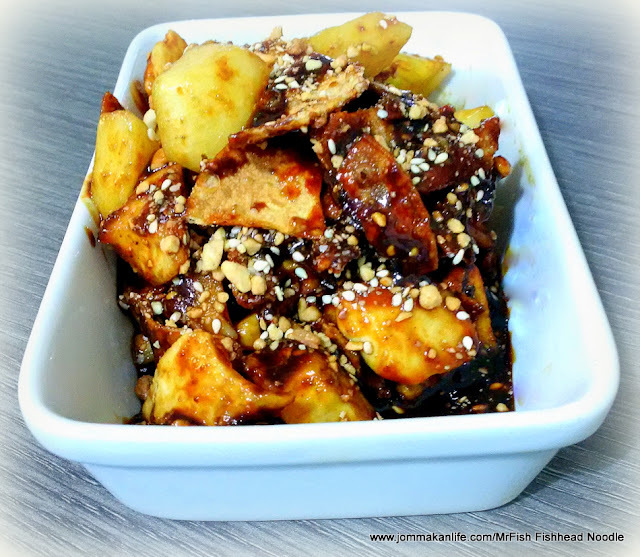 The chunks of local fruit and shards of fried cracker tossed in dark, sticky har kou (prawn paste) dressing and sprinkled with crushed peanuts and sesame seeds for its Rojak passed muster. Personally I'd like more savoury depth to the sauce which means adding more belacan to the equation. Despite my disinclination towards soup and porridge, the clear sweetness from the house speciality of Teochew Porridge with Grouper Fish Fillet (RM15.90) won me over. Simple and basic, you can't really go too far wrong with this humble dish. 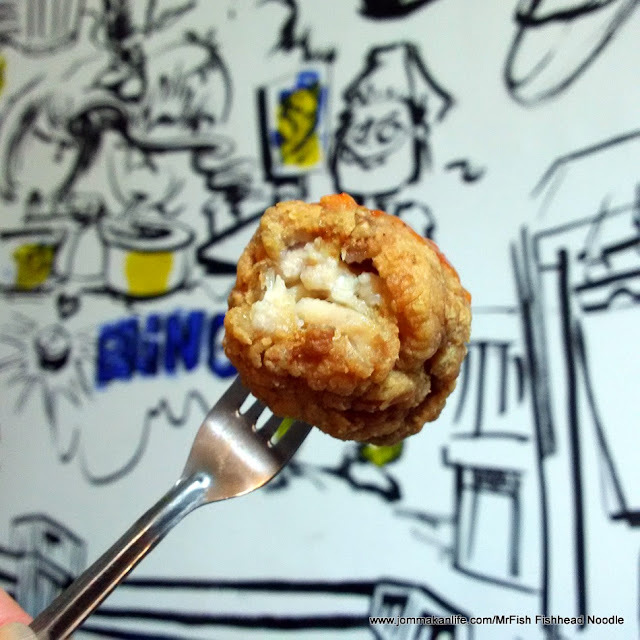 The one speciality worth returning for is Chicken Karaage (RM12.90). 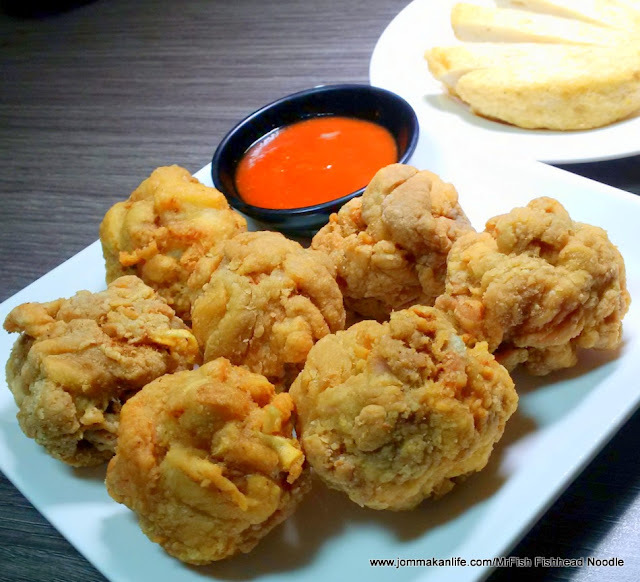 Made from succulent boneless chicken thigh meat, the crisply battered balls were delightful and came close to rivalling those found at Japanese restos. Lightly creamy with piquant spice accents, the curry broth from the Fried Norway Salmon Fishhead in Curry (RM12.90) was better than we had anticipated. Fried minced garlic and long beans gave the noodle additional flair so it got the thumbs up from our dining party. 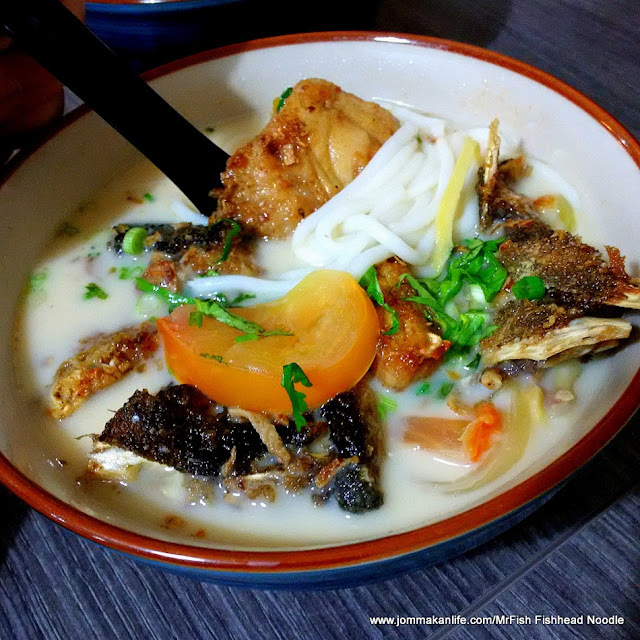 Purists who prefer to eschew milk in their fishhead noodles should find ample succour in the Fried Grouper Fish Fillet in Traditional Clear Soup (RM15.90). You can also add fish paste and fish blubber at extra charge. Our main pet peeve here is the lukewarm broth which failed to amplify the inherent sweetness of the fish. 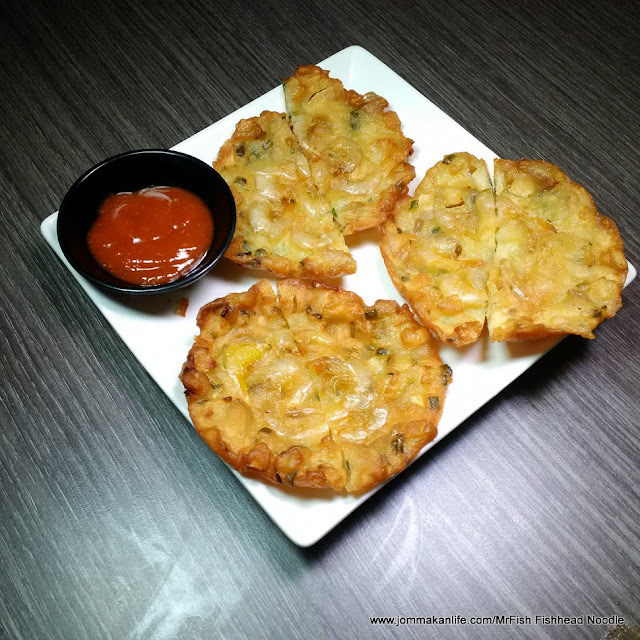 We weren't too big on the Crispy Prawn Fritter (RM5.90–3 pcs, RM8.90–5 pcs) either as I'm too spoiled by good homemade versions. The ones served at the resto were hard and dry instead of being light, airy and pouffy crisp. For those who crave for rice, fret not. Sample the Curry Fish Fillet Rice (RM16.90) with a choice of different fishes available. It tastes similar to the curry broth we had earlier but the owner told us it was a different recipe. Also additional ingredients such as fish maw, fish paste and spinach can be ordered separately starting from RM6 onwards. Ambiance-wise, the pragmatically furnished resto is air-conditioned so you can dine in comfort. Several wall murals rendered by a local artist give the place a cheery, casual feel. 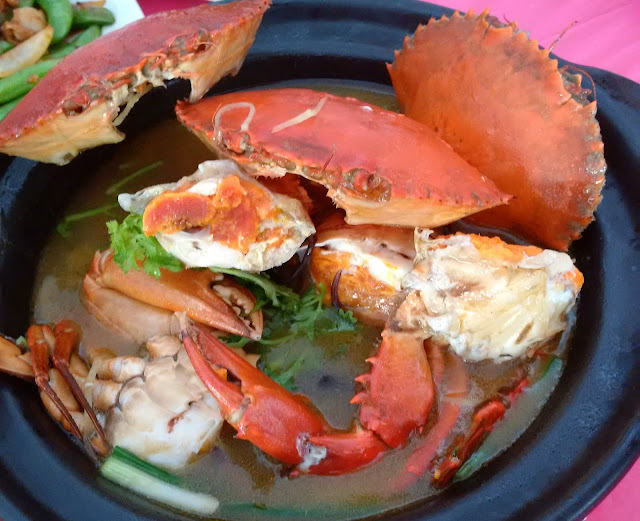 For reservations, call Mr Fish Fishhead Noodle Restaurant, tel: 012-883 1698 (Maggie) or 012-602 9878 (Khoo). Address: 45, Jalan SS20/11, Damansara Kim, Petaling Jaya Selangor. Business hours: Daily 9.30am-3.30pm; 5.30pm- 9pm except on Tuesday. The vibrant vibes of local night markets or pasar malam meet the signature street food of Penang, Melaka, Johor and other Malaysian states at V E Hotel & Residence, KL's newest 4-star hotel in Bangsar South. 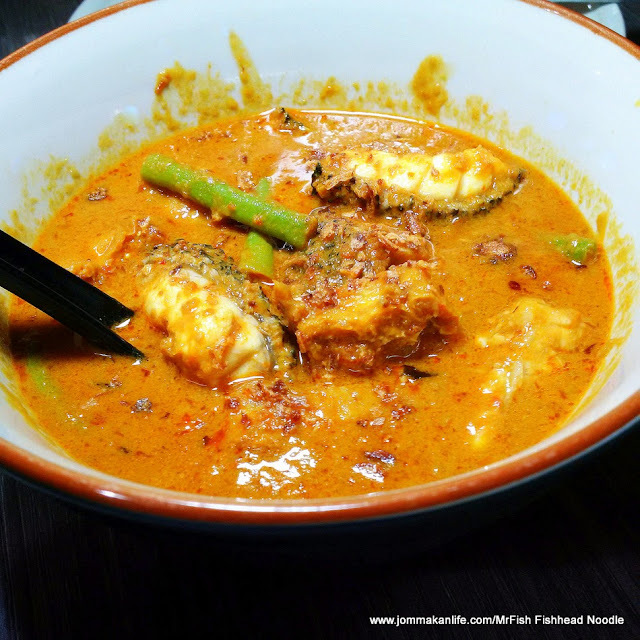 Love local laksa? Then you'd be fired up by all 13 varieties of the noodle dish at the buffet spread. Take your pick from the tangy yet appetising Penang assam laksa to laksam from the East Coast and the robustly flavoured Sarawakian version. Few people can resist the sight, smell and taste of hot-off-the-grill ikan bakar and satay...we certainly couldn't when we saw the tempting array of fish, seafood and meat being char-grilled by a chef on duty. Relish the smoky, spice-rubbed fare with your choice of dips and sauces, be it sambal belacan, dark soya sauce with sliced chilli, tamarind with sliced chilli and shallot or the classic peanut sauce for those skewers of beef and chicken. Chicken shawarma, spit-roasted lamb and roast beef should please meat-loving diners. Complement these proteins with aromatically spiced briyani rice and some soulful curries for a substantial meal. Besides all the hawker-type offerings and rustic kerabu and ulam, expect to find main dishes of ayam goreng berempah, sambal petai goreng ikan bilis, butter prawns, daging masak berkuah and pucuk manis masak lemak among others. The Straits Estate is the hotel's all-day dining restaurant which boasts soaring high ceiling and a bank of expansive glass windows with soothing views of a water feature. Nearby is the swimming pool which looks out to the bustling enclave of Bangsar South. Customary servings of dessert such as pengat durian, tapai ubi, assorted local kuihs, macarons, cakes, puddings, tropical fruit and ice kacang can be had to conclude your fast-breaking session. Available until 5 July, The Straits Estate Pasar Malam Buka Puasa buffet is priced at RM108+ per person. Group bookings of 20 persons and above will be entitled to 25% off. For reservations, call The Straits Estate, tel: 03-2246 2889. Address: Level M3, V E Hotel & Residence, 8. Jalan Kerinchi, Bangsar South City, KL.